With new land to try I couldn’t resist a trip out, so after an early lunch yesterday I took myself off for an exploratory visit to the largest of the new fields open to me. I drove onto the largest of the fields, still under stubble, and parked up by the entrance. With a field this size it’s difficult to know quite how to tackle it, especially when the field is about 40 acres and a strange stretched triangle shape. Round the edge? Straight across the middle? Zigzagging from one prominent feature to another? Eventually I decided to detect parallel with the road which runs past, but about 10 yards in from the field boundary. Half way along that side I turned and cut across one corner and followed the line of a strip which had been deep ploughed. A little over half way up that side I started to find very rough ceramic shards scattered across the surface. They were a pale orangey-pink or biscuit colour, most with a curved profile as though they were broken pieces of pipe except that they were roughly finished and not glazed in any way so I can’t imagine they were pipes. Besides, judging by the profile of the curve they’d have had to have been pipes several feet in diameter. So what to make of them? I started to wonder if they are pieces of Roman roof tile. If so, taking into account the quantity I saw scattered around a particular area, it’s possible there was a Roman building of some sort on the site, especially as there’s a lot of Roman stuff in the area. In aerial images of the spot there are no clear crop marks suggesting a former structure, but there is an undefined, slightly darker shadow in the soil. It’s something to run past the FLO when I next see her, but in the meantime does anyone know if these things really could be bits of Roman roof tile? In contrast with all the broken bits of ceramic, there were virtually no genuine metal signals. 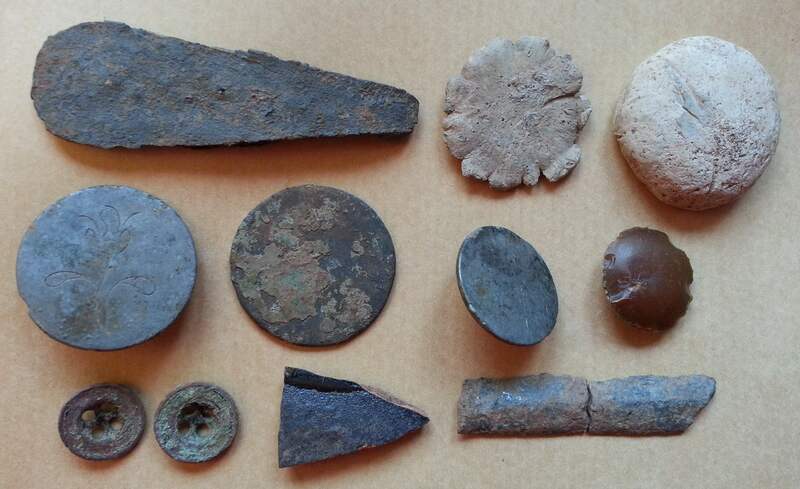 I found several pieces of chewed up drinks can, a piece of foil, one modern button and one copper alloy ring of around 1.25 inches diameter. And that was the sum total of digable signals. How absolutely weird. I know the field runs along a road but surely it couldn’t have been nighthawked so completely? My session was cut short when my phone battery died, as I no longer detect if I am unable to track my progress and precisely log my finds by GPS and photograph them on the spot. I could kick myself, and will now invest in a powerbank so I can recharge my phone in the field. 1 piece of red and pink flint-like stone – jasper? 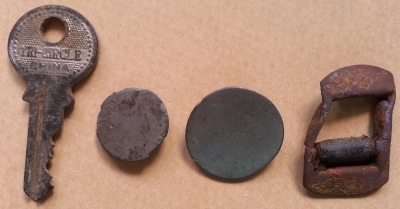 Selection of possible Roman roof tile fragments pieces of drainage pipe. This afternoon I spent a few hours at the new 60 acre pasture permission, this being my second visit to the site. I’d planned to stay for about 4 hours but in the end gave up after two and a half hours. The ground has been baked solid in last month’s heatwave, so digging is bloody hard work and reinstating the holes properly afterwards even more difficult, and I’m reluctant to dig unless I know I’m not going to leave a mess. Also, my knee is still giving me gyp a full two months after I injured it. I also had a brief repeat of last session’s wild chattering from the Deus; I’d laid it down while I dug a hole and when I picked it up again it was chattering hysterically. In the past month a number of other Deus users have reported this phenomenon and worked out that it is caused by interference from the Garret Pro-Pointer since upgrading the detector’s software to v3.0 in June. Once I’d rebooted the detector and ensured that the pro-pointer was kept well away from it, I had no further problems with the chattering. After the session, while I was changing my footware at the car, the farmer arrived and stopped for a chat. 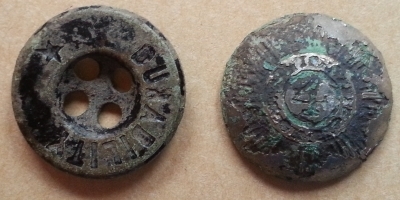 He told me that he believed there had once been a row of cottages in the field across the stream, and that towards the top end of the land he had once found some WWII military stuff including buttons and dogtags. Both areas sound very promising. 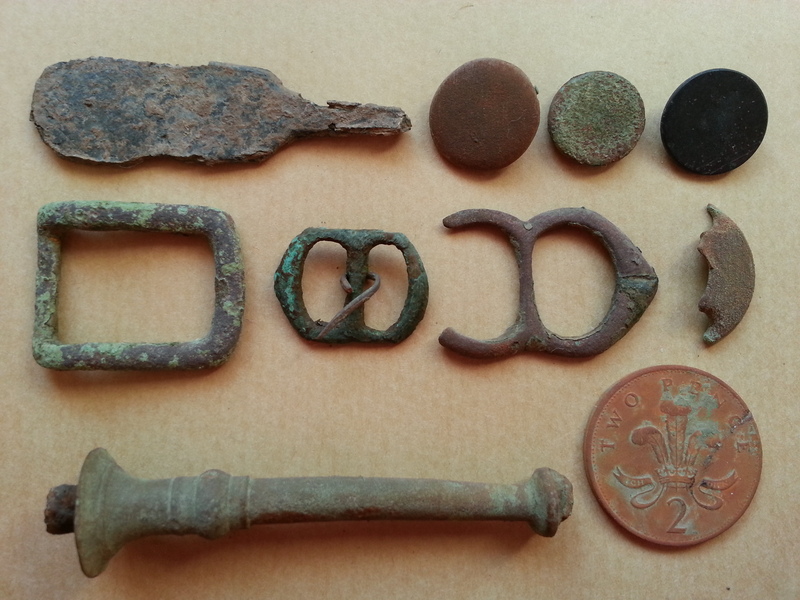 Finds: 2 plain buttons, 1 small modern key and 1 cheap modern buckle made from thin metal.